After several years of getting spammy emails from SEO marketers about how poorly my blog ranked and how my blog design wasn't SEO or mobile friendly, I FINALLY had it redesigned. I can't afford to have a website built for me but one of my favourite bloggers whose platform is on Blogger like mine had her blog redesigned with a purchased template design. Hallelujah! Not wanting to copy her, I went with a different company, Georgia Lou Studios and bought their Adelle template. I liked the various customizations they had. Not having a CLUE how to re-design my blog, I begged and sweet talked my lovely blog designer from years ago, Brittany, to help me. She helped in her free time - love her! Wanting a sleek clean design with a simply font, she delivered! Let me know if all looks good on your end! AND since I was redesigning the template I decided to drop hodge:podge and stick with Markova Design. You can read about why I use that name here. Hoping to open an Etsy shop soon to sell my pillow designs, I felt this name was more "grown up." Fingers crossed I can figure out my new serger and get those pillows ready! After years of sleeping on a queen we decided to take the plunge this past summer and get a king sized bed. 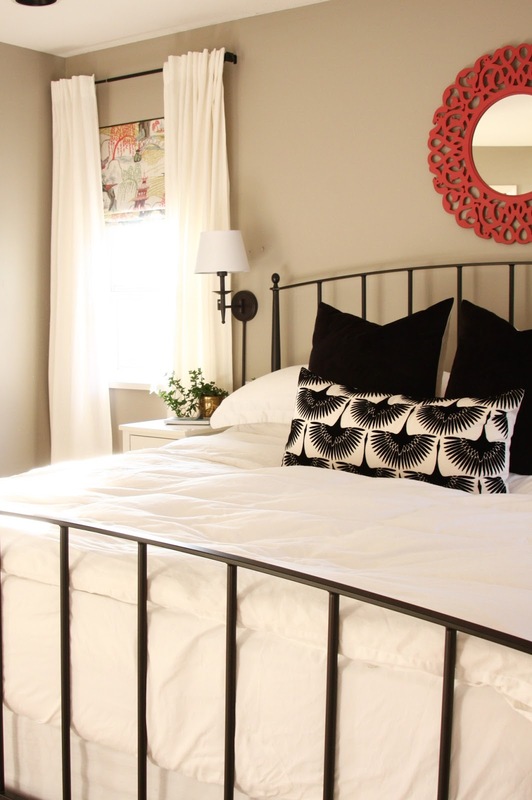 This gave me the push I needed to finally spruce up our master bedroom and make it more cozy. It is a huge and awkward space, and we tried to keep and use what we had. The biggest cost to our room re-do was our bed. Stay tuned for details about what we did! In addition to researching the best mattress for your buck, I needed to find a bed frame that was budget friendly. We had about $3000 to spend on a mattress and frame. After spending $1600 on a mattress at Sleep Country Canada, that left me $1400 for a bed frame. We needed a solid frame that would support our large king mattress. 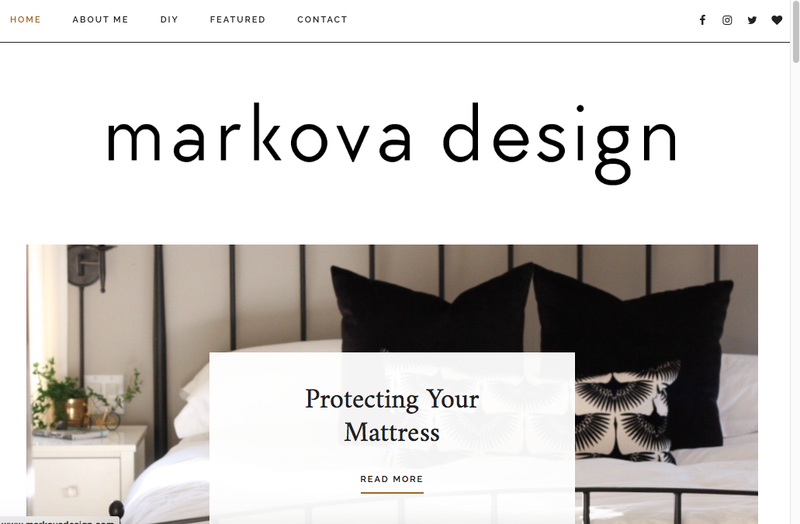 Wanting a modern farmhouse look for a bed frame, I browsed several Canadian friendly websites. In my books, Canadian friendly means they ship to Canada without crazy import and shipping fees. Some Canadian friendly sites are Amazon Canada, Wayfair, Ikea, West Elm, and Crate and Barrel. After browsing various websites I found the Mason bed at Crate and Barrel for just under $1000 Canadian with great reviews. *It is now over $1100 CDN* I googled it to see if any bloggers or designers have used it in their spaces, just to get a visual. Found the bed at New Darlings, a blog written by Robert and Christina. I was sold! I love the sleek modern lines it had. They have it in brass now, which they didn't have in the summer, waaah! I found cheaper versions elsewhere but they had bad reviews such as: squeaky, not enough mattress support, and hard to assemble. Wanting to see the bed in person I called Crate and Barrel, our closest store is a 40 minute drive through heavy traffic, to see if it was in the store. Unfortunately they didn't have it in store, saved me a drive! After talking to the salesperson, she explained their online purchasing method, return policy and after reading great reviews online I bravely ordered the bed sight unseen! They ship it across the border to their warehouse, and then you can pick it up or have it paid to get delivered. The price you see online is the price you pay! We paid $129 to have it delivered AND assembled (hello - marriage saver! ), which was worth every penny! I LOVE our new bed. My only complaint is the slats are wide apart on the headboard which makes it difficult to sit upright on the bed without your head going through that space. You need a pillow to prevent that from happening. We LOVE falling into bed every night. Why we didn't take the plunge earlier in our marriage is a mystery. Two tall people deserve a king sized bed. The space is luxurious! Now when we sleep on a queen, it feels so squishy! Stay tuned. I'll show you how I added a layer of cozy to our bedroom that is renter AND budget friendly! This past summer we decided to bite the bullet and switch from a queen bed to a king. After 25 years sleeping on a queen it was time. WHY HAD WE NOT SWITCHED SOONER? It is heavenly to sleep on a king. We resisted for so long because it would require new bedding, new mattress and a new bed frame. 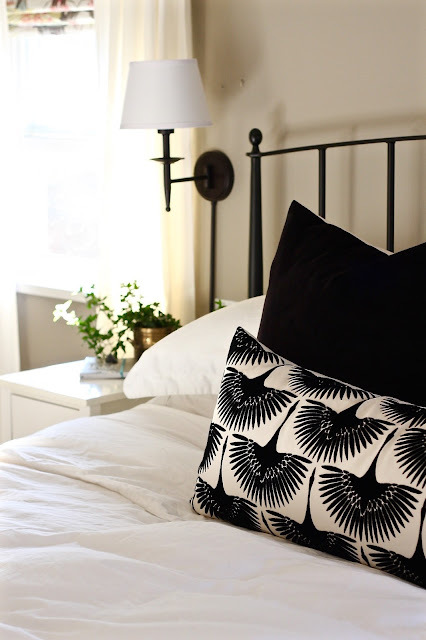 Stay tuned for our bedroom reveal, but in the meantime, here are a few peeks! My hubby and I learned early on in our marriage, you can't cheap out on a mattress. We bought our first mattress as cheap as we could find it and strapped it on the top of my Hyundai Pony and caused an accident driving it home. TRUE STORY. Oh the good old days! The quality of that mattress was awful, but we suffered for 10 years. One day my husband couldn't take it and went out and bought a way better quality mattress, one that lasted for another 10 years. But finally, we decided to switch to a king! 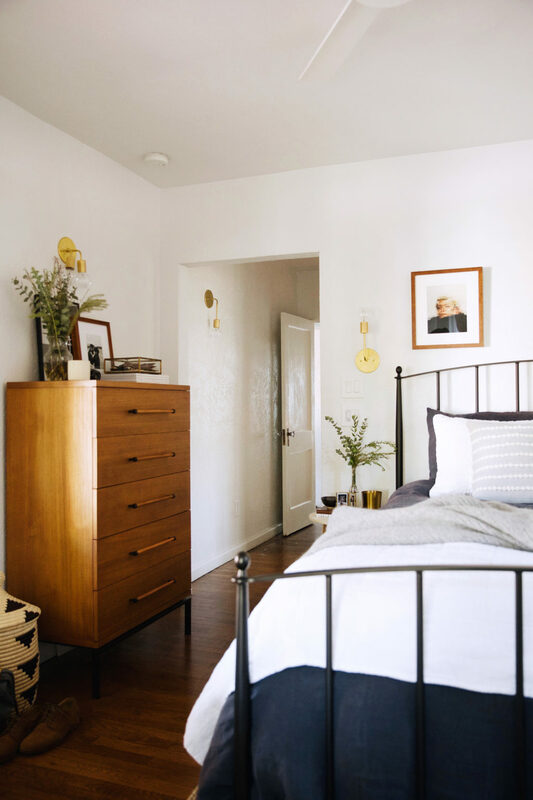 Knowing that purchasing a new mattress would be the most expensive item of our bedroom redo, I wanted to make it as budget friendly as possible yet not skimp on quality. I researched the mattresses that were rated a best buy by reading consumer reports and other articles online. Buying a mattress is as glamorous as buying a vacuum, yet we spend a HUGE portion of our life in bed, so it needs to be comfortable and not cost an arm and a leg. With a brand and style we had in mind, off we went to test out mattresses at a few stores. 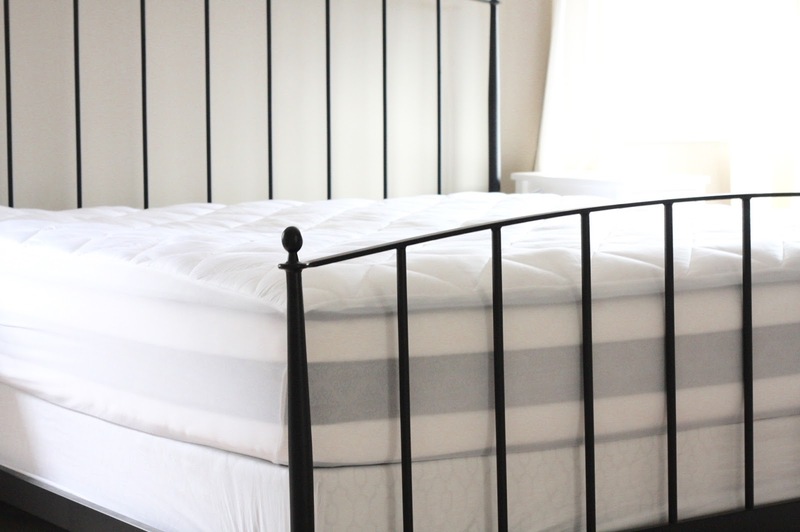 We like a mattress on the firm side without a lot of bells and whistles. Since we are both tall, we wanted one where you couldn't feel the other person moving about. After visiting a few stores, we decided on a mattress at Sleep Country Canada, and had a fabulous sales person help us pick the best one within our price point. We managed to get the Mix and Match sale price where the box spring doesn't match the mattress. Sleep Country Canada also has a 60 day trial, if you aren't happy with the mattress you can exchange it for another. No hassles. We loved our mattress and bought the extra replacement and repair insurance, just in case. One of the most important things we bought after spending all that cash was to protect the investment with a quality mattress pad. Sleep Country Canada carries a wide range of mattress pads, but we chose the Climatech Mattress pad, as it was made with rayon from bamboo and helps regulate body temperature. 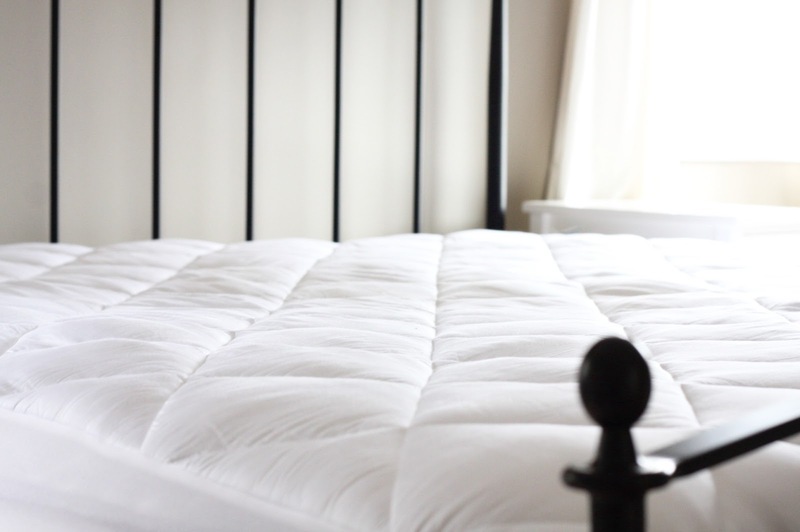 Since our mattress had a memory foam top, it can get a tad warm, we liked how this mattress pad helps with that. The bonus is it's slightly padded and gives a feeling of sleeping on a high end hotel bed! I LOVE falling into bed every night. We are so happy that we took the plunge after all those years! 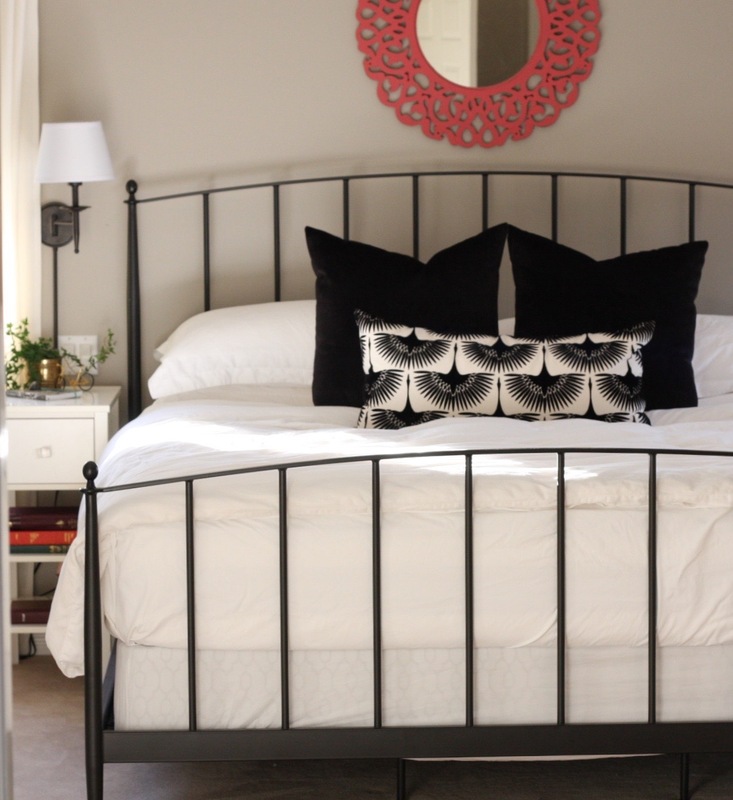 Stay tuned for the bedroom reveal, I'll share how we revamped our room on a budget!